The latest title in the fast-paced adventure/thriller Sigma Force series, Crucible, will be available from William Morrow on January 22, 2019. Well-known skilled Sigma operatives Monk, Gray, Kowalski, Painter, Seichan, Kat, and Lisa are back for another action-packed race against time. The subject matter of artificial intelligence (AI) is both timely and terrifying to readers. Rollins highlights some of the amazing abilities of human-like AI, while also warning of the uncertainty in unleashing such an uber-intelligent entity into the world. As with all of his Sigma Force series, Rollins weaves the latest in scientific and technological advances into the story. He includes a very helpful and interesting “check the facts” section at the end, in which readers discover in annotated detail that most of the technological, scientific, and medical situations which seem impossible and far-fetched in the story are actually in fact NOT fiction. Perhaps because Rollins expertly shows that AI could be all too real in the near future, Crucible is truly captivating and thrilling. Crucible is an engrossing read, written through multiple narrators, alternating chapters between different groups of Sigma members. I won’t give away too much of the plot, because what would be the fun in that?! No spoilers here, folks! The story starts on Christmas eve with a very pregnant Seichan home with Kat and her two young daughters, while their men are out having a drink celebrating Gray’s soon-to-be fatherhood. Upon arrival home they find the Gray’s home ransacked, Seichan, Penny, and Harriet missing, and an unresponsive Kat on the floor, unable to offer any clues as to what happened or who took their family. Meanwhile, across the continent in Portugal at the University of Coimbra, a modern day group of witches called Bruxas is meeting to view a cutting-edge form of AI known as Xenese, created by brilliant young programmer and scholarship student of Bruxas, Mara. As Mara watches unnoticed from the webcam thousands of miles away, nine robed assailants brutally murder the five women, and the only clue caught on camera is a fifteenth century book known as The Hammer of Witches, with historical ties to witchcraft trials during the Spanish Inquisition. Now it’s up to Painter and his team to connect the mysterious, tragic incidents, with two main goals in mind. First, they must track down Xenese before it gets into the hands of those who wish to use AI for destruction and evil. But, most importantly to best friends Monk and Gray, they must find Seichan and Monk’s daughters before it’s too late. A pulse-pounding race against the clock ensues. I thoroughly enjoyed this book, even though much of the time I felt ignorant of the high tech programming and medical breakthroughs being carried out. 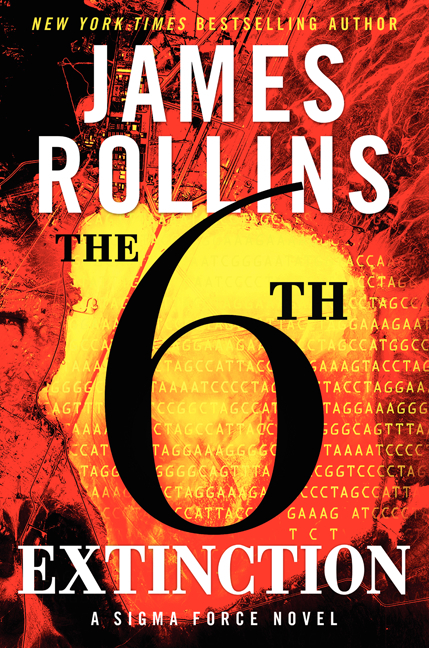 It really is amazing how much research Rollins would have had to undergo for this novel. It is packed with science, historical details, and action. What more could a reader ask for? Oh…romance! There’s a bit of that in there as well, but not too much. Who has time for romance when the fate of the world is at stake, you know?! I’m a sucker for romance, but I have always been an extremely loyal fan of James Rollins and, as such, I trust that each new volume in the Sigma Force series will not disappoint. I hope you enjoy it as well! Though the novels do not have to be read in order for maximum enjoyment, I understand the need for starting at the beginning of a series. I am a stickler for that, myself. For a list of the Sigma Force series novels in order, click here. As with all of Rollins’ Sigma Force series novels, The Seventh Plague is full of pulse-pounding action & suspense from the very first page. This is one of the (many) reasons I love his novels so very much. Another big reason is the thorough amount of historical & scientific research he completes and weaves into the stories. The notes section at the back of his novels are sometimes just as exciting as the story itself! It’s fascinating to find out what parts of the story are fact and which are fiction. A British archaeologist, Harold McCabe, who has been missing for over two years is found in the Egyptian desert. Unfortunately, he dies before he is able to give any information that could lead to the whereabouts of the rest of the research team, including his son. A startling discovery occurs during the autopsy – his body had started to mummify while he was still alive. To make matters worse, those who had worked on McCabe’s body for autopsy become extremely ill with an unknown, but highly contagious disease that quickly spreads through Cairo and beyond, threatening to become a global crisis. An old love interest of Director Painter Crowe, Safia al-Maaz, happens to be McCabe’s colleague, and she reaches out to Crowe (and Sigma) for urgent help. Commander Gray Pierce and his team (with some of the usual Sigma characters: Seichan, Monk, and Kowalski) set out, risking their lives as they discover a threat linked back to ancient history and biblical passages. Along for the adventures are McCabe’s daughter, Jane, and the old archaeologist’s prodigy and friend, Derek Rankin. As they try to piece together the puzzle from McCabe’s research, others are tracking them, trying to find answers as well. They are forced on the run by a cold-hearted, extremely skilled female assassin on par with the likes of Seichan. Gray and his team unearth clues in an ancient tomb beneath the desert sands, while Painter’s group must travel to a remote Arctic landscape in an attempt to stop the release of another set of plagues upon mankind. The novel is rich with historical details, involving famous figures Mark Twain, Nikola Tesla, and Henry Morgan Stanley. The Seventh Plague moves forward at breakneck speed (in trademark Rollins style), switching back and forth between the action in the desert and that in the Arctic. Readers won’t be able to put the book down until the final page. Will all the Sigma team members make it out of this story alive? You’ll have to read it and find out for yourself. You won’t be sorry you did! Fans of Steve Berry, Ken Follett, and David Baldacci will surely enjoy any and all works by James Rollins. He is a master of blending historical mysteries and scientific discoveries into a terrific story, each and every time. The Bone Labyrinth will be published on December 15, 2015 by William Morrow. I consider James Rollins to be the King of adventure suspense novels. He has been my absolute favorite author for a long time. The Bone Labyrinth is the newest installment in the Sigma Force series, featuring an amazing cast of characters including Gray, Seichan, Kat, Monk, Kowalski, and Director Painter Crowe. I’m normally not a fan of long running series, because I find myself being bored with the characters after two or three novels. However, I have read every single one of James Rollins’ books and loved each and every page of every book. He does a great job of focusing on different characters more intensely with different books, so as not to bore the reader with too much backstory or day to day kind of happenings. 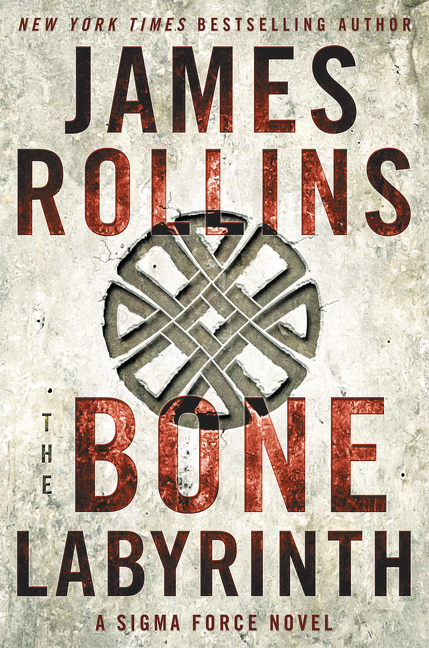 Like all of his Sigma series novels, The Bone Labyrinth started off with a bang and continued with breakneck speed through different countries with high stakes adventure and thrills. James researches the material for his novels with great intensity and includes a sort of fact or fiction section at the end of each novel. This is one of the things I love so much about his work – he shows the readers where his amazing ideas originated and also gives credit where credit is due. In this particular story, Gray and Seichan are sent to assist in finding and protecting Dr. Lena Crandall, a young geneticist who is trapped in an underground cavern in Croatia, after a research assignment turns deadly & dangerous. After rescuing Lena and a young priest, they begin to follow clues that will take them through ancient tunnels in Ecuador and to the lost city of Atlantis. Meanwhile, Monk and Kowalski are sent to an Atlanta primate research center to talk to the other Dr. Crandall, Lena’s twin Maria, also a geneticist who is working with Baako, an intelligent gorilla she has trained and researched since birth. When Lena, Baako, and Kowalski are kidnapped and taken to China, the story becomes a rollercoaster ride as they begin a race for their lives. The story spans over 50,000 years of human history from the earliest Neanderthals to present day genetic engineering & modification. I won’t give much more of the plot, because I don’t want to give away any spoilers. It’s more fun to read and find out all the surprises as you go. Buckle up, readers…this is a wild read! If you have never read a James Rollins book, I would encourage you to give one a try. They are absolutely amazing, and are hard to put down once started. I would start with the beginning of the Sigma series, which is Sandstorm, or read a stand alone novel (Deep Fathom, Ice Hunt, Amazonia, or Subterranean). I can’t wait for his next book! Ashfall is the first in a 3, and planning to be 4 book series by Mike Mullin. Mike Mullin is an Indianapolis based author, whom I met at an ALA conference last year. He is well spoken, super smart, and the most down to earth guy. After reading his first book, I have even more respect for him and his awesome talent. The book was published in October, 2012. However, I finally got around to reading it after hearing my students rave about how amazing it is. The book is written for the YA crowd, but there are certainly many adult themed scenes. I enjoyed the book very much, for the suspense, and the non-stop action which kept the story propelled forward as if the reader was actually there with Alex and Darla making their way through the ashfall. The story supposes that the supervolcano under Yellowstone National Park erupts with no warning and ash covers the earth for thousands of miles around the eruption site, including Alex’s hometown while he is home alone for the weekend. Alex is determined to get to where his parents are and reunite with his family. The readers can assume it will not be easy if only for the ash covered landscape and extreme weather fluctuations, but there are so many other obstacles Alex must face which make for a nail-biting read. This is one of my all time favorite YA books so far. I couldn’t put it down. Well done, Mike. I look forward to reading Ashen Winter, Sunrise, and the upcoming 4th installment. I absolutely loved this fast-paced action thriller. 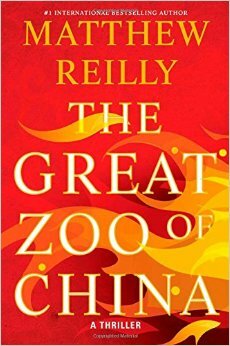 I had never read anything by Matthew Reilly prior to this, but now I think I will go check out some of his other novels. It reminded me quite a bit of my favorite author, James Rollins’, books. The story line is incredibly creative and interesting. It certainly does have some far fetched elements, but that is what makes fiction so much fun! From start to finish, this is a roller-coaster of non-stop action. It is a bit gory in parts, so I wouldn’t advise reading it if you are squeamish with talk of blood. I would recommend it with flying colors, otherwise. Awesome!!! A fabulous fast-paced action/adventure. James Rollins never disappoints, as his novels always keep you reading furiously until the final pages. He does extensive research into all of the topics covered and provides author’s notes at the end of the novel. This is really informative and helps the reader to decipher what is or isn’t true in the story. This book hooks the reader from the very beginning and provides thrills the whole way through. I LOVE IT!